After seven years, Atlanta’s Infinite Energy Center has officially dropped Pepsi as its beverage partner for Coca-Cola. Formerly the Gwinnett Center, Duluth’s Infinite Energy Center hosts everything from hockey games to conferences and political elections, and had a partnership with Pepsi since 2011. They announced their new partnership with Coca-Cola in mid-January of this year. Coke will now be the exclusive non-alcoholic beverage partner for all three of the center’s venues—the Infinite Energy Arena, Forum and Theater. This includes not only soda, but power drinks, tea, coffee, juice and other options as well. The length of this partnership has not been disclosed, but the Center is calling the partnership a “long-term commitment” and is excited about the upcoming changes. “We are thrilled to provide our guests and fans the familiar hometown Coca-Cola brand,” said General Manager Joey Dennis in a press release. “This partnership will amplify the energy and excitement of the new campus developments that are underway.” This long-term commitment will offer unique marketing, promotional and activation opportunities for both parties involved. 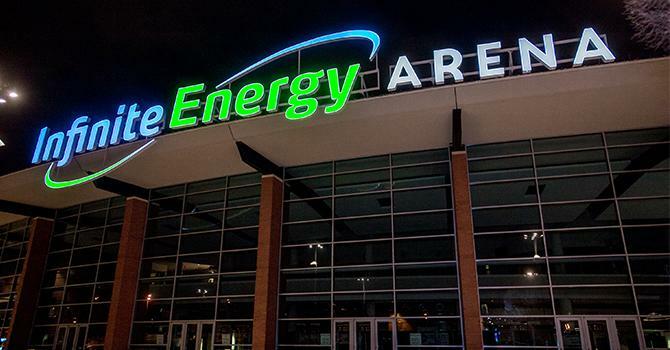 “We are so excited to welcome @CocaCola to the Infinite Energy Center family,” the Center said in a tweet earlier this month. Next time you’re seeing a concert, bridal show or ballet you’ll have all the Coca-Cola products you love to choose from!